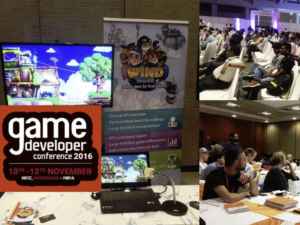 Wind Tales was invited by the Dutch Games Association to attend the NASSCOM Game Developers Conference in Hyderabad, India. We had our own booth and met a lot of great enthusiastic people. Afterwards we where invited to visit the Rainbow Children hospital in Hyderabad to talk to the hospital’s Manager about serious gaming, Wind Tales and Pulmonology in India. Thanks to everybody involved for the great event.